Brazil’s Imperial Princess Isabel was the last technical ruler of the Brazilian Empire (1822-1889). Although her rule was brief and generally ineffective, she is responsible for one of the most important events in Brazil’s history: the abolition of slavery in 1888. Isabel (1846-1921), the Princess Imperial of Brazil, whose time as regent is known almost solely for the abolition of slavery in 1888. Isabel (whose full birth name, in delightfully-royal fashion, was Isabel Cristina Leopoldina Augusta Micaela Gabriela Rafaela Gonzaga de Bragança e Bourbon) was born in 1846, the second of Emperor Pedro II’s four children. Although Pedro II had two sons, both died before they turned 3, leaving Isabel as the presumed heiress to her father even while the deaths of his sons spurred his doubts that the imperial system in Brazil would survive and he increasingly viewed his role as a mere head of state in the latter half of the 1800s. Although Pedro II himself was fond of his daughters (the second daughter, Leopoldina, died at the age of 23 in 1871) and saw to their education, he was not immune to prevailing gendered stereotypes of his time and place, and felt that she would not be able to govern Brazil in the event of his death. Nonetheless, Pedro II saw to it that Isabel received the same type of education from a private tutor that his sons would have had, and Isabel was taught literature, history, geography, philosophy, chemistry, astronomy, Latin, French, and other subjects. However, her father excluded her from all discussion of politics and did not take her with him on trips or to political meetings, leaving her a titular heiress with no practical training. Isabel married French prince Gaston d’Orléans, through an arranged marriage in 1865. Although the prince initially described Isabel as ugly, they developed a strong attachment, and by all accounts they had a happy and loving marriage until their deaths (she in 1921, he in 1922). Likewise, he seemed to love Brazil, and he even fought for Brazil in the Paraguayan War (in what was by any account a brutal war, he has been accused of his own atrocities in battle, including the alleged burning down of a hospital with patients inside), though the historical record on his responsibility is at best mixed). Shortly after the war ended, Isabel served her first of what would be three regencies for her father. As Emperor Pedro II and Empress Teresa Cristina traveled to Europe, Isabel became acting ruler of Brazil. However, her role as ruler was primarily titular, with powerful ministers/politicians Rio Branco and José Paranhos, along with Isabel’s husband, expected to do the actual governing behind closed doors. Nonetheless, Isabel played an important symbolic role during the first regency. Brazil had been gradually moving towards abolition of slavery for some time; as early as the 1820s, in constitutional debates for the new empire, some politicians spoke out against the institution. Mounting pressure from the English led to Brazil’s formal abolition of the slave trade in 1850 (though illegal trade continued). After the Paraguayan War, however, the abolition movement really accelerated; during the war, many slaves and ex-slaves fought, often gaining numerous awards for their conduct on the field, and to return to slavery was an obvious problem. Additionally, many military leaders themselves felt the institution was problematic, particularly in light of Afro-Brazilian men’s conduct in the field during the war. This shift, combined with Brazilian Liberals who had been pushing against Conservatives’ defenses of slavery since the 1850s and the natural decline in slaves available after the 1850 abolition of the slave trade, gave new impulse to the abolitionist movement. Thus, in 1871, Brazil passed the Law of Free Birth, declaring that any child born to a slave woman after 28 September 1871 [the date of the law] would be free. 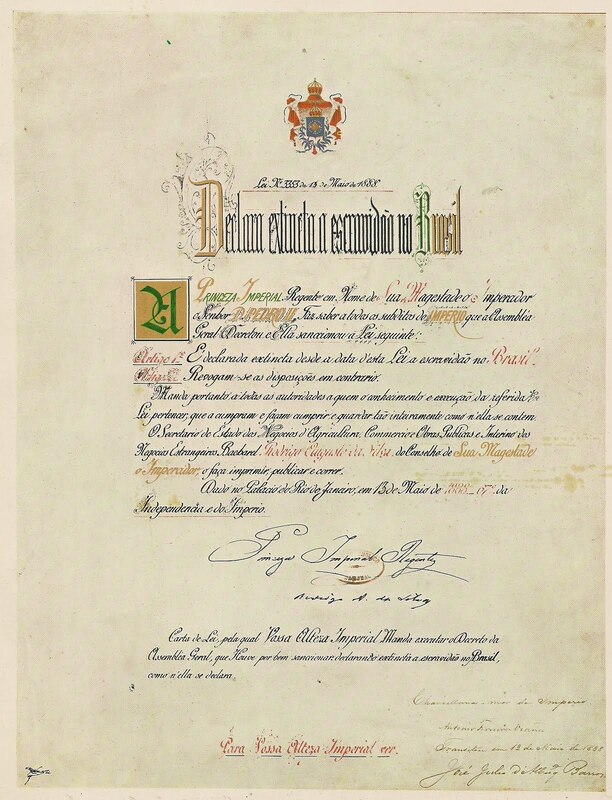 Although Viscount Rio Branco wrote the law and Brazil’s parliament passed it, it was Princess Isabel’s signature that made the law the rule of the land. It would not be the last time her name was directly tied to the abolitionist movement. Isabel was regent a second time from 1876-1877, a period in which both personal issues and political violence troubled her reign. When her father returned, he distanced himself both from her and the political events of her second regency, and she and her husband both withdrew from national politics, taking a retreat in Europe for several years before returning to Brazil in 1881. Meanwhile, the abolitionist movement in Brazil continued to gather strength, and even conservative plantation owners were increasingly turning to immigrants from Europe, particularly those from Germany and Switzerland, to replace the declining slave labor on plantations. This gradual transition would make the eventual abolition of slavery in Brazil non-violent, standing in stark contrast to abolition in the United States. In 1887, abolitionists managed to pass the “Law of the Sexagenarian,” providing freedom to all slaves above the age of 60. With virtually no new slaves through the slave trade since the 1850s, no new slaves through childbirth since 1871, and now no slaves over the age of sixty, the end of slavery in Brazil was clearly in sight. Isabel became regent for a third and final time when Pedro II fell ill in 1888. When she assumed power for a third time, conservatives were in power in parliament, and were still resisting total abolition. However, by this point, Isabel allegedly felt slavery’s time was fast coming to an end. In 1888, she appointed a new government, led by João Alfredo Correia da Oliveira, also from the conservative party. The new government quickly introduced a law abolishing slavery in May of 1888; it passed the Chamber of Deputies (by a count of 83-9) before going to the Senate, which also passed the law. On May 13, 1888, Princess Isabel, who suddenly became known as A Redentora, or “The Redemptress,” signed the “Golden Law,” making Brazil the last country in the western hemisphere to abolish slavery. The official “Golden Law” that abolished slavery in Brazil on 13 May 1888. 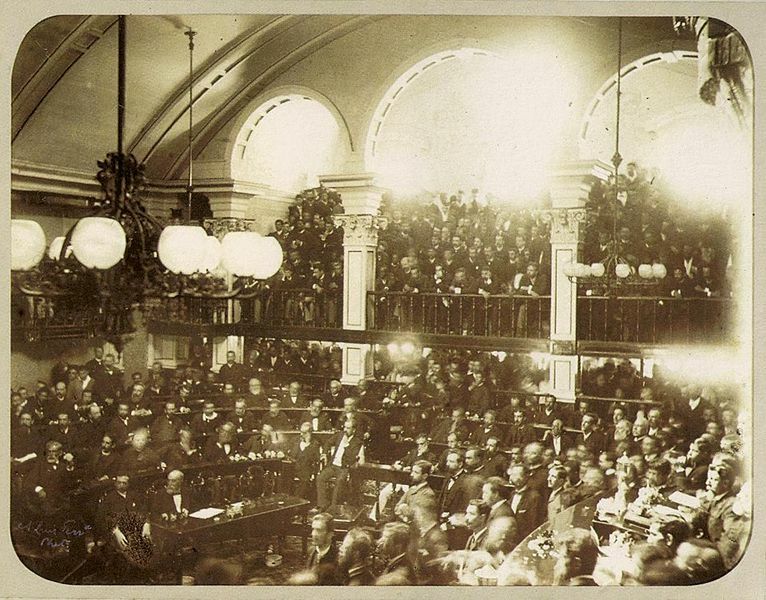 Brazil’s Senate Discussing the Golden Law abolishing slavery in 1888. Although the law finally ended slavery in Brazil, it was not enough to save the Brazilian empire. Pedro II returned to Brazil in August of 1888, but he was too ill to effectively govern. Additionally, the law had alienated conservative plantation-owning elites who had depended on slavery and who exercised no small amount of political and economic power (in spite of the passage of the Golden Law). 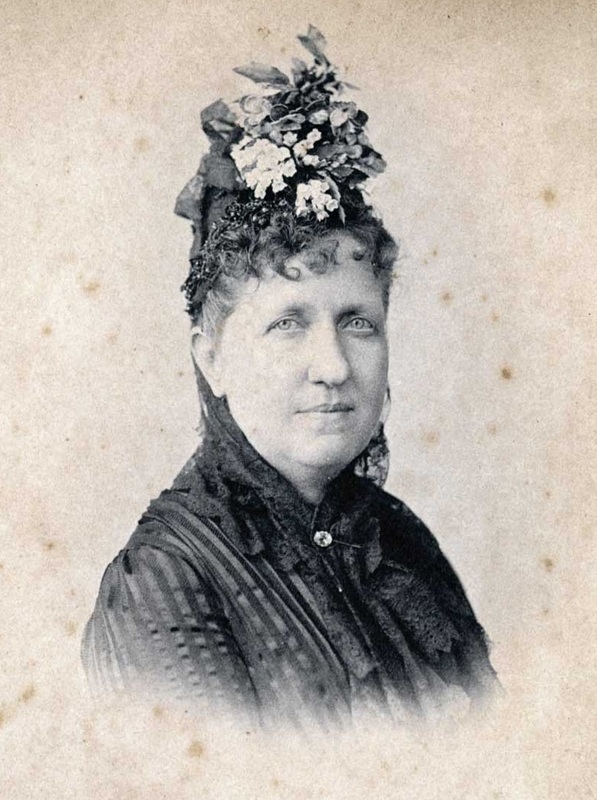 Others in Brazil did not trust Isabel, who had not worked much with politicians (not necessarily through any fault of her own, given the way her father and men in general viewed women in government at the time), and her marriage to a Frenchman further spurred distrust. With plantation owners’ support for the crown eroding, and military officials, liberals, and republicans increasingly wanting a new government, the empire’s days were numbered. In November 1889, the military, with the support of politicians, overthrew Pedro II and his family, meeting little resistance; indeed, Pedro II seemed resigned to the outcome, and when neither he nor Isabel spoke out in favor of restoration, even monarchists ended up supporting the new First Republic (though there was some monarchist unrest that quickly met repression). Isabel spent the rest of her days in exile in France. Although the Brazilian government lifted the ban on the royal family traveling to Brazil in 1920, Isabel’s worsening health made any chance of a return to her birthplace impossible, and in 1921, she died at the age of 75. 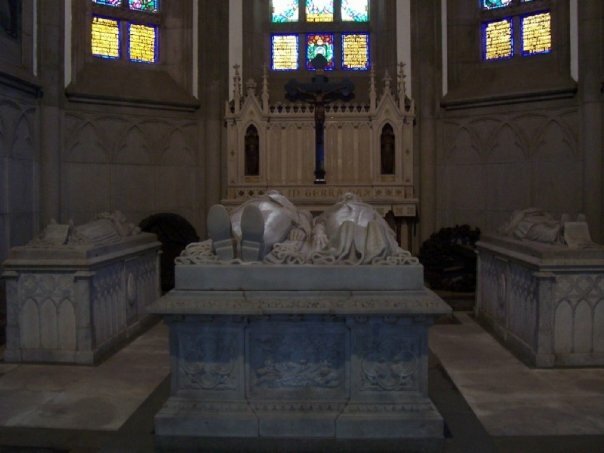 In 1953, however, her remains (along with those of her husband) were repatriated, and in 1971, they were buried alongside those of Isabel’s parents in the cathedral in Petrópolis, the imperial center of Brazil. The tombs of Pedro II and Teresa Cristina (center), with the tombs of Princess Isabel (left) and Prince Gaston (right), in Petrópolis, Brazil. In hindsight, Isabel’s time as regent was perhaps underwhelming in almost every regard: denied the true authority of office based gendered stereotypes and attitudes towards women at the time, she was a reluctant leader, and leader in name only. However, as Roderick Barman, one of the pre-eminent scholars on the Brazilian Empire, commented, “she acted decisively only once on a single issue: the immediate abolition of slavery on May 13, 1888.” While Isabel’s overall were slight, given the attitudes towards women in politics in nineteenth-century Brazil, her role in the abolition of slavery has also made her one of the most well-known names in Brazilian history. This is part of an ongoing series on Brazilian figures in history. Previous entries have included black activist Abdias do Nascimento and Portuguese explorer Pedro Álvares Cabral. This entry was posted in Brazil, Get to Know a Brazilian, Latin American History. Bookmark the permalink.